Sister Mary Helen Buscarino, OSF, has come a long distance from her Italian birthplace, and she has met a lot of people along the way. Her life as a Franciscan sister has given her opportunities to help others, and she used every one of those chances to make someone else’s world better. She admits she had selfish motives. Her family came to the United States when she was just one-month-old. Although Italian, her father served n the United States Army during World War I. The family settled in Buffalo’s West Side. 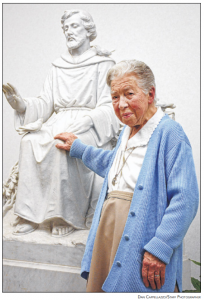 The Franciscan Missionary Sisters of the Divine Child that gave her religious instruction at Holy Cross Parish helped guide her into the religious life. The order later merged with other Franciscan sisters forming the Sisters of St. Francis of the Neumann Communities, based in Williamsville. Her life as a missionary was short lived. After a couple short months in San Paulo, Brazil, Sister Helen was diagnosed with colon cancer and needed exploratory surgery. She was told if she did not come back to the United States she would die from an infection. “That ended my missionary work that I wanted to do,” she said. The Missionary Sisters of the Divine Child was founded to provide religious instruction for public school children and bring Christ to the marketplace by home visitation. So, Sister Helen devoted most of her religious life to those ministries. She also taught at Immaculate Heart of Mary, Our Lady of Loretto, St. Nicholas and the Diocesan Education Center, as well as schools in Brooklyn and San Antonio, Texas. In 1975, Sister Helen began a 24-year ministry at St. John the Baptist Parish in Lockport. There she served the migrant workers who came to work at the local farms. They couldn’t work in bad weather, and if they didn’t work, they didn’t eat. The Food Bank of Western New York provided food that could be purchased cheaply. A case of Cheerios cost $1.10. So for just a few dollars, Sister Helen started a food pantry at St. John’s to provide the staples to the migrant workers. The pantry still bears Sister Helen’sname, although she no longer is involved. “If I get a donation I send it to them, but that’s about it,” she said. She also made home visits, bringing Communion to the homebound and taking Census for different parishes. She liked meeting people with the same values and faith as her. “They accepted me and I accepted them,” she said. “It was mutual. “That’s how I became interested in helping people like Martha and her children,” she said. have little or no retirement savings. nutrition counseling and a satisfying healthy meal. Always the optimist, Sister Helen sees having myasthenia gravis and being unable to drive or do outside ministry as giving her an opportunity to read more and get more involved in her prayer. Sister Helen, my mom’s 1st cousin, is the most amazing, caring, inspirational & loving person I know. It is an honour to know her. I love her dearly! !